Bi Plane Pendant Light with Rustic Walnut Finish- The bi plane ceiling light pendant is the perfect finishing touch for a little boy's airplane theme bedroom or playroom. Bi plane pendant ceiling light takes one 60-watt bulbs. Made of satin glass and a walnut finish. Comes with 6 ft. of cable for adjustable height. Full Description Bi Plane Pendant Light with Rustic Walnut Finish- The bi plane ceiling light pendant is the perfect finishing touch for a little boy's airplane theme bedroom or playroom. 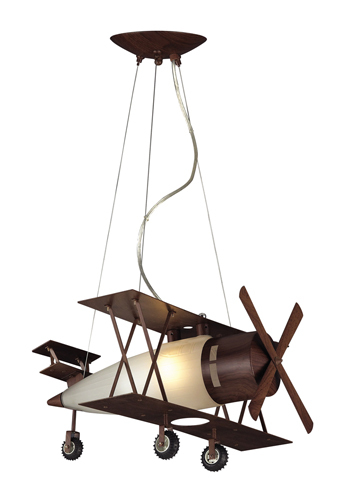 Bi plane pendant ceiling light takes one 60-watt bulbs. Made of satin glass and a walnut finish. Comes with 6 ft. of cable for adjustable height.